... all the fish, and nothing but the fish, so help me God! Yesterday I went to the Broadway Market and was drawn as if by a magnet to Broadway Seafood. I bought a Pompano -- that is the fellow up above -- and a Bluefish. The whole fish! They scale it for you and everything. And they were going to take the heads off but I said no. And they were going to take the tail fins off and I said no. They know me so they just smiled. They do not speak a lot of English anyway, do the folks at Broadway Seafood. Last night we cooked up these fish. Yum! 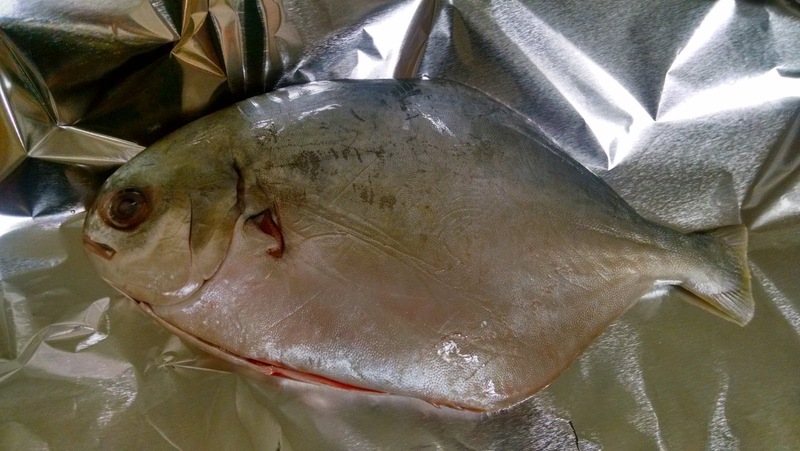 You do not realize how easy it is to cook whole fish. None of my cooking magazines will go near it and so I found a recipe from Mark Bittman, the Minimalist. You turn the oven to 400 degrees and wrap the fish in foil with some, ahem, aromatics. I used red onion rings and lemon slices and kosher salt and black pepper. And toasted walnuts, which Bittman suggested. Well, he asked for pine nuts. Whenever I see the words "pine nuts" I do not even see them. I just think walnuts. I also roasted some mushrooms and asparagus. Everything went into the oven and came out perfect. Triumph! I make a lot of mistakes but sometimes everything turns out great. This fish was amazing. 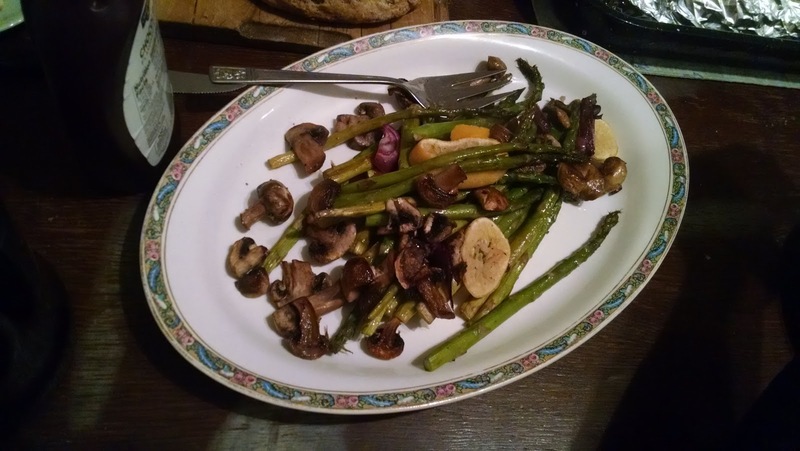 As was the asparagus. How come stuff never looks like this when you have your friends over? That is what I would like to know. It is just you, or it is just the two of you, and things look right out of Martha Stewart. I remember thinking that in California when Leonard Pennario came over for dinner. The dinner was good but not as good as dinner had been the night before when I was just cooking for myself. Maybe you just try too hard sometimes. I do not know what it is. Well, I know one thing. I will be going back to Broadway Seafood! I want to cook my way through their fish! The whole fish, all the fish. And nothing but the fish! That chocolate zucchini cake for Dorothy's birthday was so gooey and good! I am not bragging. I am giving credit to the recipe. I had a feeling it would be good. Remember when I made a chocolate zucchini cake for Howard's birthday? Fatal error! We were eating it for weeks. We put it in the fridge and every day it was as if no time had elapsed. I think I am still working off that particular chocolate zucchini cake. The one I just made, it uses two whole cups of zucchini, so come summer we will have to remember that. When you are surrounded by zucchini this cake is at your fingertips. SO GOOD. There it is up above occupying pride of place in the coffee hour buffet. 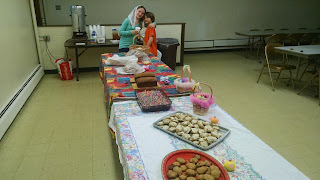 Well, we took the picture before Mass. Later it had more competition. The coffee hour continues to be great fun but I have to say, I do not know how the Blums did it for so long. They are the couple at St. Anthony's who did it for six years or something and I am in awe of them, I will tell you that right now. I am kneeling at Mass and all I am thinking about is did I set the Crock Pot on the right setting and what happened to those coffee cups I thought were there. The friends bringing the cups were late and I was up there in the choir loft singing the Kyrie and hyperventilating. Thinking: Did they forget we were losing the hour? No, I am the one who always forgets things like that, they always remember them. Where are they? Where are they??? On the bright side we now have a coffee team. We have a bunch of people pitching in. My friend Lou made the coffee today and he also brought yummy banana bread. Bill and Margaret, the friends with the cups, did turn up. We were also aided by my beautiful niece and nephew Barbara and Georgie, photographed here in the quiet before the storm. They contributed the Easter baskets visible on the table, so sweet of them. Kids can't help jumping the gun on Easter. That is all right by me. We sang happy birthday to Dorothy and it only took Dorothy two breaths to blow out the whole box full of candles. People are already alerting me to more birthdays coming up. So that will mean more cakes in the future. 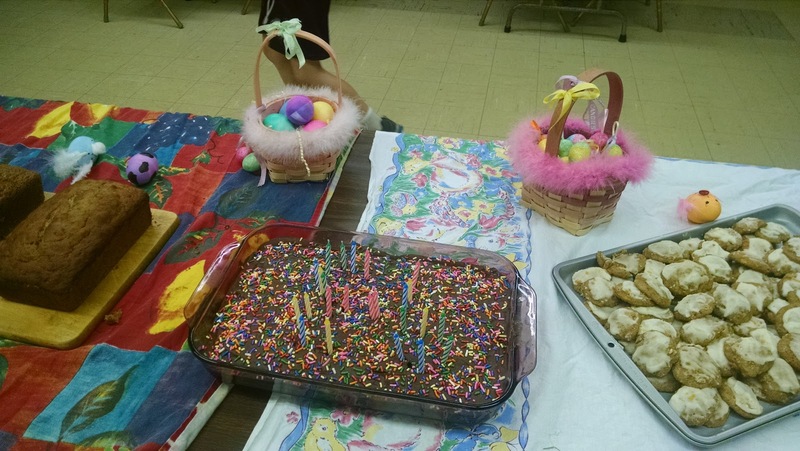 Last week one the way home from church Dorothy let it slip that her birthday was the next day. 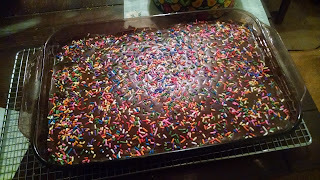 So I am making a birthday cake for tomorrow's coffee hour. That is it above! And here is a close-up. 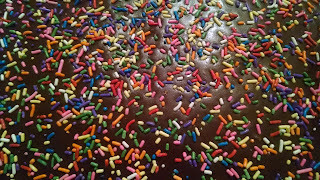 Sprinkles are the greatest when it comes to birthday cakes. They are beautiful on white frosting but I think especially stunning on chocolate. I inadvertently made an, ahem, healthy recipe. The cake is the Chocolate Zucchini Cake out of King Arthur Flour's Whole Grain Baking cookbook. Reason being, I was out of white flour. The frosting was from online. It is here on Kitchn for the next time you need to rustle up chocolate frosting fast. You know me, I love baking birthday cakes. One regret I have is that I never got to make one for Leonard Pennario. Looking through my Betty Crocker cookbook today I saw a lot of recipes I want to try for birthday cakes. They have a Starlight Cake and a Chocolate Chip Cake that both seem to have a lot of fans online. This is the ancient Betty Crocker cookbook that my friend Lizzie gave me for my 19th birthday. It is always young. Just like Dorothy! I hope she likes chocolate, you know? I did not think to ask. Of course how could she not. 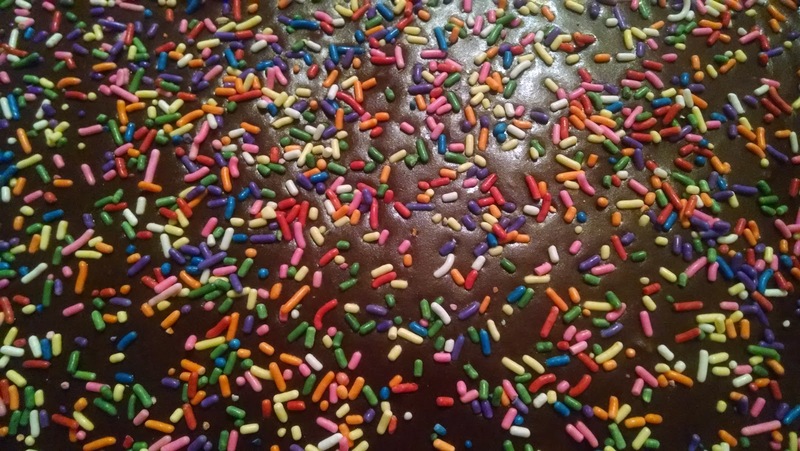 You do not make it into your 90s without chocolate. Another thing, you do not make it into Daylight Savings Time without chocolate. Losing that hour tonight will not be fun! But that is where this cake comes in. If chocolate cake doesn't get you out of bed, nothing will! I know it is early but I cannot help thinking of this poem by e.e. cummings I loved when I was in grade school. 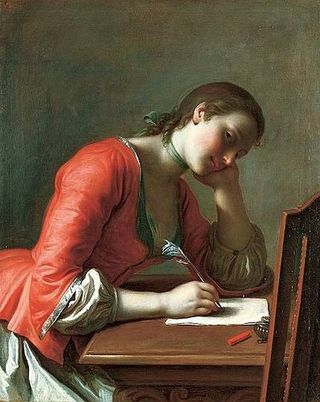 There is the poem. Now it is me again talking. It is sweet how e.e. cummings was so enthralled by the typewriter which I am guessing was kind of new at the time. The spaces, the punctuation, the capitalization or not. Even his name, it is so typewriter. There is a font, American Typewriter. I think the poem should technically be read in that font. I remember when I was a kid, and pretty little, I mean, about 9 or 10, I kind of "got" what he meant. That is how good he was. The world puddle-wonderful. And back then before iPhones we actually did come running from hop-scotch and jump-rope. How quaint I am. 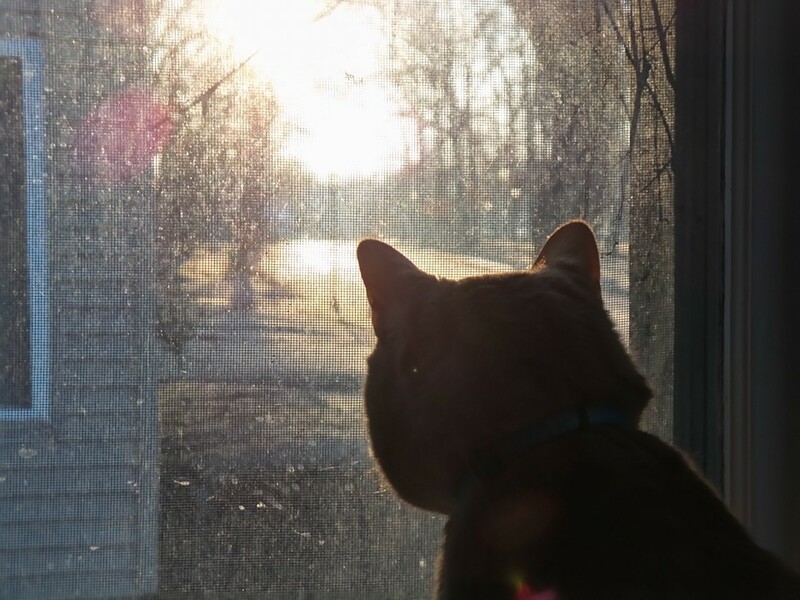 Up above is a picture Howard took of Jeoffry looking out at the spring morning. I like to put pictures like this on the Web log because I do not want them to get lost in the shuffle of Facebook. We put it up on Facebook with the caption "Mine is the sunlight, mine is the morning." Because that was a song by Cat Stevens. Cat, get it? At first I did not. Spring! A little early but still. So we return, boats against the current, borne back ceaselessly into A Dollar. There are also treasures to be found in the aisle where they have tossed a bunch of books. You have to keep your eyes open in this kind of aisle. There were kids' coloring books there. I was bummed there were no grown-up coloring books. Well, give them time. There was also a pile of the hardcover Better Homes and Gardens Best Recipes of 2011 for $2.99, in case you need that volume to complete your collection. But here is what I found that I love. It is Company's Coming Cookies cookbook by this author Jean Pare. OK, so it is not exactly elegant. They have a bunch of Company's Coming cookbooks. Cookies, casseroles, chicken, I forget what else. I had never heard of this line of cookbooks and I assumed they were just these cheapie little no-name things. But then I opened the Cookies cookbook. The thing is, our coffee hour at St. Anthony's has been rocking. Every week it seems more people show up. Which is a great thing! And I was thinking, it will be fun to find more cookie recipes suitable for this discerning crowd. With an emphasis on "crowd." 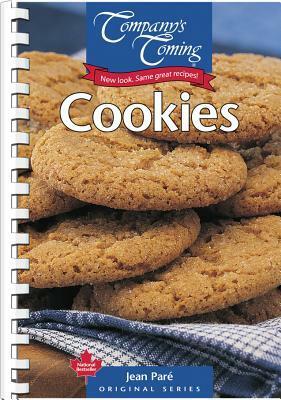 All the cookies in this book not only looked good, but the very first recipe, Gingersnaps, makes 90 cookies. 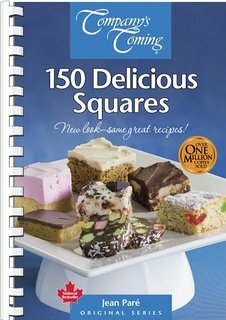 Most recipes seem to make at least four dozen. Many make 5 or 6 or 7 or 8 dozen. Now you are talking my language! Also I love the retro look and sure enough, this Jean Pare is an old-timer. She was born in 1927 and she is the best-selling cookbook author in Canada. Canadians love to eat and they know what they are talking about when it comes to rich food. Anyway. All this was mine for $1.29! Look, I have written a couplet. My only criticism was when I got it home and was studying it, there were no bar cookies. But now I see why. Googling around I found this. Back we go into A Dollar. Got to find that square deal! 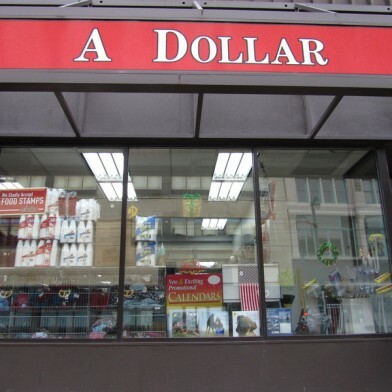 There is this dollar store downtown at the Main Place Mall. I think it is called just A Dollar. It is indeed! This is funny, I just found this Buffalo Niagara site with a picture of the place. That is it up above. They also have a little write-up. Everything from candles, body oils, greeting cards, bathroom, kitchen, home supplies and more for only a dollar. Body oils, tee hee. But not all the description is as accurate. The deal is, everything unmarked in the store is a dollar. Most things have red tags on them with higher prices because the world being what it is, prices rise. The store has other strikes against it too. The aisles are painfully narrow and it is usually crowded so there is always a chorus of "Excuse me"s. On the bright side it is nice when people really do say Excuse Me. So, not perfect, this dollar store. However. There is hardly any other shopping in downtown Buffalo and so when I have the yen to shop on my lunch hour I have had no choice but to explore it. Today I bought Star Anise ($1.69) and ground ginger and powdered mustard, both for $1.49. I was out of ginger so that saved me an errand. The ginger is 1.5 ounces, same as you would find somewhere else, but the ground mustard is 4 ounces! The spices are Mimi's Products and most are $1.49. That includes cumin seeds, mustard seeds, sesame seeds, caraway seeds, dill seeds etc., all in reasonable-sized bottles. Things you cannot find at Albrecht Discount or at CVS. It gets to be kind of torture because people are always trying to get past you as you are studying everything the spice aisle here has to offer. But it is worth the investment. There is another treasure I found but I will have to get to that tomorrow because today I am not done with describing the spices. A Dollar also has whole nutmeg -- whole nutmeg! -- and peppercorns. Turmeric, flax seeds (ground and un-ground), whole and ground cloves, annatto seeds, pretty much everything you look for is there. Things for Indian and African and Latin and Middle Eastern cooking. Check it out. A dollar store is a wonderful thing. It spices up your work day! 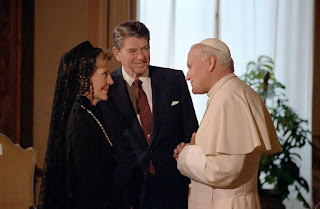 In honor of Nancy Reagan, who just passed away, let us admire how beautiful she looked in a mantilla greeting Pope John Paul II. She looks charming in that picture, you know? She always looked graceful but did not always look charming. 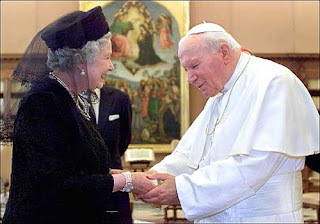 Just the other day, by coincidence, I read that women still have to wear a head covering when meeting the pope. It must only mean under formal circumstances. 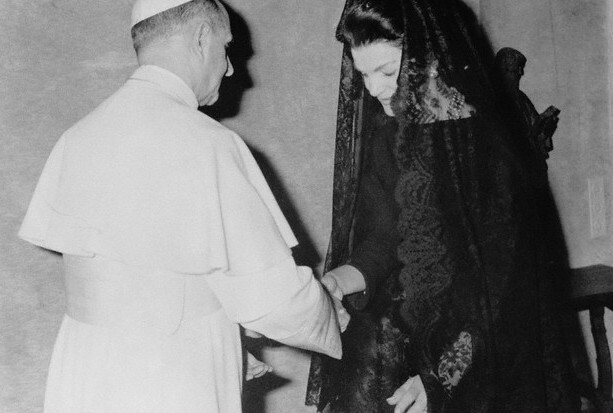 Jackie Kennedy of course rocked the mantilla too. Hers is amazing. I would love a long mantilla like that, should my friends wish to keep that in mind for when next Christmas rolls around. Queen Elizabeth combines the look with one of her signature hats. Salve, Regina! Here is Michelle Obama meeting Pope Francis. No mantilla! That is because it was an informal setting. 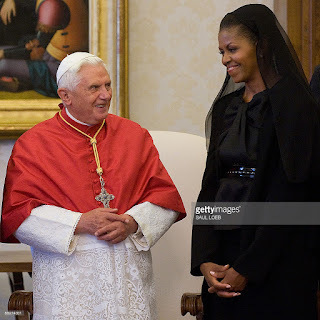 After all, she did put one on for Pope Benedict XVI, who seems to be appreciating how lovely she looks in it. What is it about black mantillas that make a girl look like a supermodel? That is one reason I wear one to Mass. Pennario had an audience with the pope and in this one picture. 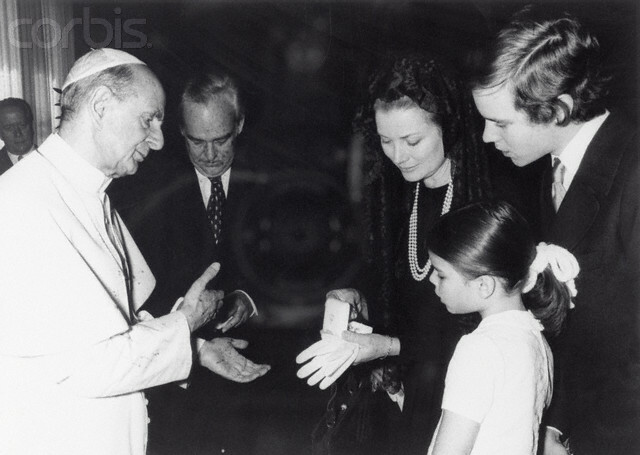 He is holding a rosary and talking to the pope. Very cool! And all the ladies in the family are wearing veils. Very, very cool. 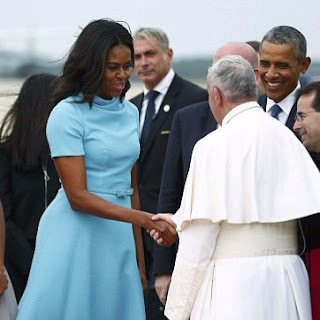 There is this fascinating inside-Vatican story on dress codes should it transpire that you are about the meet the pope. All these pictures and I did not realize that you are not only supposed to wear a black veil, but a black dress as well. The only exception is if you are a Catholic queen or the wife of a king. Then you may wear a white veil and a white dress. However that rule does not apply to the principalities of Monaco or Liechtenstein. Let us check to see if Princess Grace wore black to meet the pope. Ah! Sure enough. That is Princess Stephanie in front. What a problem she grew up to be. The ancient protocol surrounding meeting the pope is probably relaxing, if it has not already. However I hope not. It is so elegant. We must revisit this subject soon! From Flower Power we go to Flour Power. I am becoming intrigued by the idea of the loaf cake. It just sounds indulgent, you know? Loaf, as in just sitting around, plus cake. 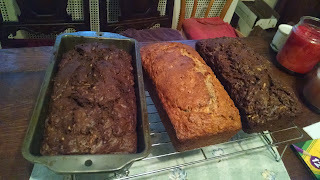 Loafing around today I made two kinds of loaf cake to bring to coffee hour tomorrow at church. 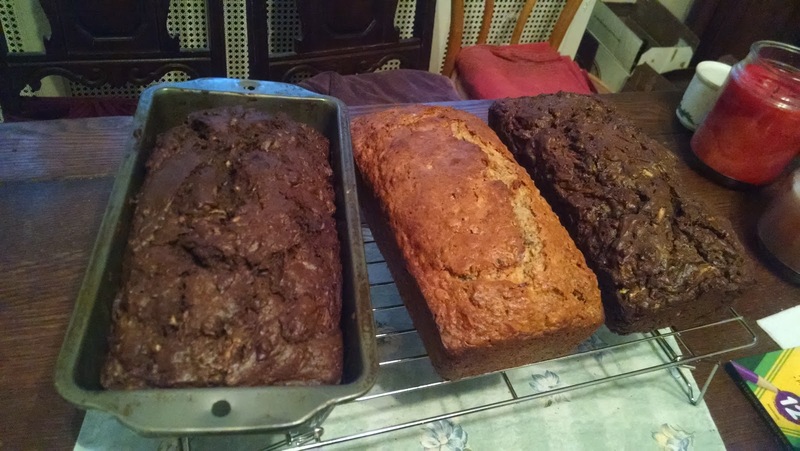 One is a Chocolate Zucchini Loaf Cake out of Cooking Light. The other is also out of Cooking Light. It is Oatmeal Banana. What makes this fun, you know? But I had a stressful week and it was so relaxing. I also got in some work on writing projects so, all in all, a fine Saturday by most measures. With the Chocolate-Zucchini Loaf Cake I proceeded with caution because there was one review online and the person gave it only one (1) star. She said it was dry, then said, "Well, maybe my zucchini was dry." Sometimes I hate online reviews! You always feel remiss if you do not look them up. Would that we were back even five years ago, when it was not so ingrained that you had to check up on what every other cook in the world was thinking. Anyway, I was scared off by that review and so I made only one loaf. Then that loaf came out so delicious that I had to make another. Thanks, stupid reviewer! Now I will have to comment and correct her. Anyway. On the tarmac for future church coffee hours are a few other loaf cakes. I have two in mind especially, from Cooking Light's Dec. 2013 issue. And you wonder why my house is full of magazines. This is why. One is Eggnog Coffee Cake. It does not actually have eggnog in it which has comment writers fuming. I care not. Any eggnog I had for Christmas is long gone. And eggnog spices are pretty much just spice cake spices and can go any time and any season. The other is Rum-Raisin Bundt Cake. You can sub a loaf pan, or maybe two loaf pans, for a Bundt pan, good for me because grease and flour as I might, I cannot keep cakes from sticking to a Bundt pan. It is just this hand that life has dealt me. Just as Leonard Pennario was dealt the gift to play the piano but not, say, the accordion, I have been dealt the hand to bake in loaf pans but not in Bundt pans, my German name and heritage notwithstanding. There is something so nice about the loaf pan. You cut it in slices and then you cut the slices in halves. Not for nothing do they talk about the loaves and the fishes. They multiply to feed the multitudes! Yesterday I was out on assignment with my friend Sharon who is a photographer for The Buffalo News. And we passed a booth where people were selling bouquets for Hospice. Must buy!! Both of us picked one up. That is an $8 not badly spent. 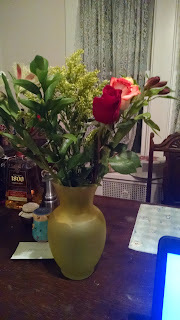 All of us treat ourselves to flowers way too rarely if you ask me. Now you have a good excuse because it is for a good cause. I went home and the first thing I did was put my bouquet in a yellow vase. I was all excited about it. Then I cleaned off the table around the vase. There is an Israeli folk story about that. A woman buys a beautiful vase and brings it home, and then the vase looks out of place on the messy table, so she cleans around it on the table where she placed it. Then the table looks out of place in the messy room, so she cleans up the room. Then the room looks out of place because it is clean and so -- well, this is the point at which I usually run out of gas, but the woman in the story, she cleans up the whole house. All because of that vase! 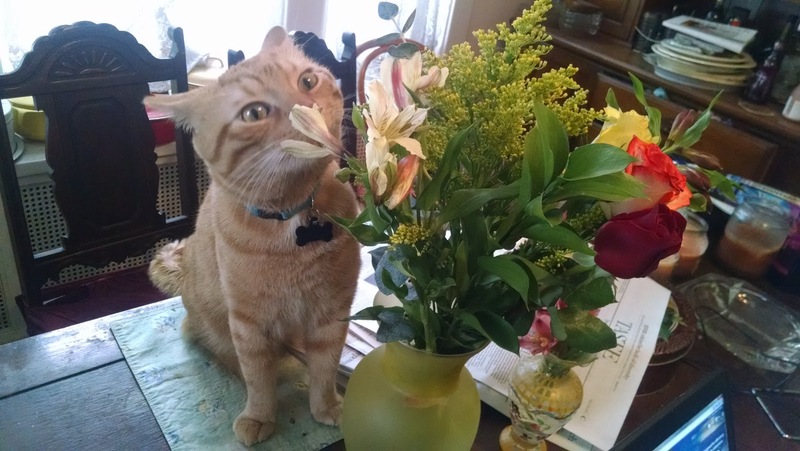 Jeoffry took time to smell the roses. It makes me think of all the times I pass those flowers at Albrecht Discount and everyone else but me is buying them. I know those flowers are not for a cause, unless you consider Aldi a cause, which I do sometimes. But they are pretty and cheap and I do see a lot of people buying them, men and women alike. It also makes me think that this summer I must work to cultivate my, ahem, cutting garden. Spring is beginning early this year, methinks. We will have extra time to plan and strategize and get an early start. This will be a good and colorful year!